The Port of Tilbury’s expansion will provide vital extra resilience to the UK’s port infrastructure. Bigger, bolder, even broader in scope: it might be hard to see how Tilbury, already recognised as one of the UK’s most multipurpose, flexible and successful ports can improve on itself. The answer is twofold: expand into a 152-acre site next door to the port, and continue to create and grow dynamic supply chain solutions within the existing port boundaries. Pumice and carbon dioxide are two ‘new arrivals’ at the port in the past year, and cargoes such as roll-on/roll-off, grain, paper, forest productsand recyclable glass – to name just a few – continue to grow year on year. Tilbury2, to be built on former Tilbury Power Station land, is well on its way. In November 2018, the Planning Inspectorateconfirmed that Forth Ports Group’s application for a development consent order (DCO) had been passed to the Secretary of State. A final decision is expected early in 2019. Ecology site clearance work accelerated in 2018, detailed design work has continued, and a construction contract has been agreed. In other words, once the plans are approved, Tilbury is ready to press the button. Tilbury2 is expected to be ready for work in the first half of 2020. 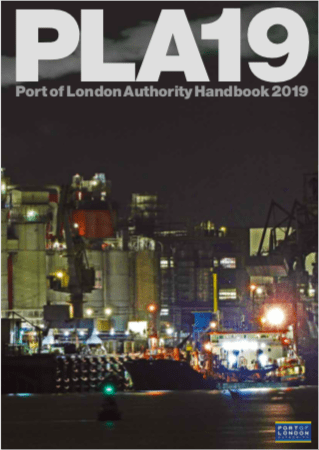 “We could start work as early as April 2019; we have started some of the authorised pre-works already and are doing as much as we can in advance,” says Peter Ward, commercial director of the Port of Tilbury. The new development will operate as a satellite of the present port, he says. Tilbury’s AEO trusted trader status will apply to Tilbury2. Crucially, in the light of Brexit, it will provide significant new capacity for unaccompanied roll-on/roll-off trailers in the South East, with direct access to the market. The DCO provides for an upgrade to the roundabout close to the main port to improve traffic flows and the port will be spending significant sums locally on upgrading footpaths, cycleways and the historic Tilbury Fort. Investment will go into heritage projects across the water in Gravesend and in electronic information boards for the Tilbury-Gravesend foot ferry – a well-used service for people travelling to and from work. The port has an excellent record of ecological mitigation works, particularly in relation to the development of London Distribution Park. Recently it has constructed a nine-acre water vole park; a badger sett is also being built on the Tilbury2 site. Tilbury2 will deliver the UK’s largest unaccompanied ferry terminal and Britain’s largest construction hub to market in 2020. In June 2019, Tilbury Grain Terminal reaches its half-century – and what better way to celebrate that landmark than with a new extension? A 16,000 tonnes capacity, automatic fill flat store extension, now being built, will increase the terminal’s total storage capacity to 136,000 tonnes. terminals in the UK. In the past 25 years, a total of 35 million tonnes has been handled through the terminal. More than 200 silos, ranging from 60 to 120 tonnes, provide the flexibility and capacity to handle numerous different types and grades of grains – including wheat, barley and human consumption beans and soya beans. n The London Paper Terminal, opened in 1999, celebrates 20 years of operations in 2019. Previously called the Finnish Terminal, the facility has been used by UPM since day one for handling and storage of its commodities. Based on a 36-acre site, the terminal provides 700,000 square feet of covered storage and 115,000 square feet of operational canopies. Products handled include newsprint, magazine print, packaging materials and palletised fine papers, totalling around half a million tonnes a year. Alongside these cargoes, the terminal makes the most of its expertise and capacity to handle bricks, timber, plant and equipment and specialised cargoes. There has been significant investment in new bespoke handling equipment to ensure the terminal continues to be a technology leader. provided a haulage portal and VBS (vehicle booking system) for optimising delivery slots and providing visibility to the customer for just-in-time deliveries. connections to Scandinavia, Zeebrugge and the Arctic Circle. n Stanton Grove provides third party logistics (3PL) services to the paper and forest products industry and works closely with the Port of Tilbury. n Transfennica runs roll-on/roll-off services connecting London Paper Terminal with Belgium, Scandinavia, Estonia, Russia and Poland. TGP’s £175 million investment in this project created about 420 jobs during construction and up to 50 people are now employed in operating the plant. And there’s more to come. Plans have been submitted for phase two of TGP – a 20 MW power plant which will burn baled waste brought to the port. The bulk rail terminal built by the port for this project and others has secured new traffic flows and is being expanded again. Forth Ports has invested in new infrastructure, including a mobile crane, supporting equipment, a bespoke storage area and system upgrades. The terminal, which has a direct connection to the national rail network, enables side-loading rates of 300 tonnes per hour and also handles aggregates for FM Conway and green glass for OI Glass. NFT operates one of the largest on-dock chill stores in Europe. Holding up to 25,000 pallets across 250,000 square feet of warehousing space, the facility has multi-temperature capacity and allows for cross-docking chilled and ambient cargo. Browns Food Group has an 8,000 pallet warehouse for chilled, frozen and deep-chill cargo; it also provides for cross-docking, as well as unloading overweight containers, relabelling, repalletising and rewrapping. And still there’s more . . . . .
Tilbury has always been a multipurpose, multifunctional specialist. And that means the port is constantly welcoming new cargoes and setting up new, bespoke supply chain solutions for a range of customers. Trial shipments of pumice stone began in 2018, and regular shipments are now confirmed for 2019 onwards. The pumice, shipped from the volcanic Greek island of Yali, is used to manufacture lightweight building blocks for the construction industry. Tilbury has also secured its first liquid bulk customer. Nippon Gasses is now regularly importing carbon dioxide, and in 2019 it will open a purpose-built facility with specialised storage tanks on the quayside. The CO2 is in demand for a wide range of uses, including for beer pumps, abattoirs, refilling refrigerated transport units, producing carbonated drinks and beer, and even injecting the bubbles into crumpets! P&O is preparing to move to a purpose-built river berth within the Tilbury2 development – a move which will treble its freight capacity on this key route to 500,000 units a year. The ferry operator has said it expects the new capacity to provide an unrivalled service for anyone exporting to or from London and the South East. unloading of second-hand vehicles and wheeled, tracked and agricultural plant and other machinery. boring machines, bridges sections, temporary office buildings and even the Olympic rings of 2012. The Tideway ‘giant sewer’ project has also highlighted what can be achieved at Tilbury. Cargoes consolidated and handled at Tilbury and moved by river have included portable cabins/offices, spoil, piles and steel, while large pontoons,flat-top barges and jack-up barges have been stored within the port. Initially it will run three times a week to Daventry, and on to Scotland twice a week; the service is expected to increase to a daily frequency as demand grows. Tilbury also hopes to see a rail link to Liverpool established in 2019.